Experience the exotic natural beauty and wonders of the famous Garden Route in effortless exploring along the picturesque Southern Cape Coastline. The Garden Route, perennially green, has a mild Mediterranean Maritime climate and lies on a narrow belt between the Outeniqua and Tsitsikamma Mountains and the Southern Coast of Africa and includes a blend of charming towns, dramatic & scenic landscapes, tall trees, deep gorges, shimmering lakes, majestic mountain ranges, golden beaches and lush indigenous forests. 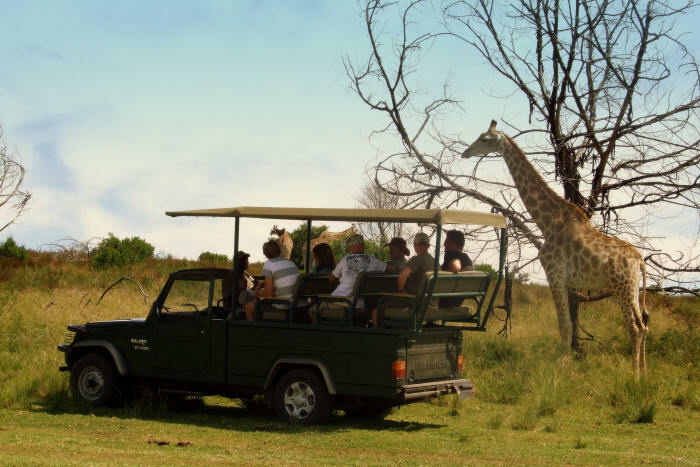 This tour is ideal if you do not have time to visit the Eastern Cape & Kruger where the Big 5 roam for an authetic African Safari exceriences, but would like to add a taste of Wildlife and Nature on the Garden Route..
Game Drive at Plettenberg Bay Game Reserve in a guided open 4×4 vehicle (The smaller size of the game reserve – 2200 hectares – and responsible conservation determines the number of large animals. Predators are kept separate in a large enclosure and do not hunt. Over 35 species of game, including lion, rhino, giraffe, hippo, crocodiles, buffalo and a large variety of antelope in their natural habitat which is also home to more than 101 different bird species. Tsitsikamma Coastal Park with its startling beauty is located at the foot of the Tsitsikamma Range and is cut by rivers that have carved deep ravines into the ancient forests with its centuries-old trees such as Yellowwood, Stinkwood, Hard Pear, Ironwood and Kamassi. Tsitsikamma Coastal Park: Boat trip to view the otherwise inaccessible Storms River Gorge. Woodcutters Trail at Storms River in the Tsitsikamma Forest: Journey down the old Storms River Pass, and experience the indigenous forest from the comfort of a specially-designed vehicle. Explore beautiful Knysna, Jewel of the Garden Route, situated on the Knysna estuary, surrounded by lush ever-green forests. The Knysna Heads is one of the most striking geological features along the entire southern African coastline. Oyster Tasting at Knysna, oyster Capital of South Africa. Sir Lowry’s Pass provides beautiful views of the Hottentots Holland Mountains, Somerset West, False Bay, Strand and the Cape flats and Table Mountain in the far distance.